I turned the headlights on my 2005 Honda Civic EP3 Type R to drive home the other evening and both bulbs went out after about half a second on dipped beam. Strangely, main beam was still working perfectly. Great, I thought, what were the chances of both bulbs going at the same time? I always jump to the worst case scenario and assumed the alternator must have surged and blown both bulbs, or I was going to be cursed with some nightmare intermittent electrical fault requiring hours of diagnostics (electrics isn't my strong point). At best I thought I was going to have to try and track down a blown fuse or relay. 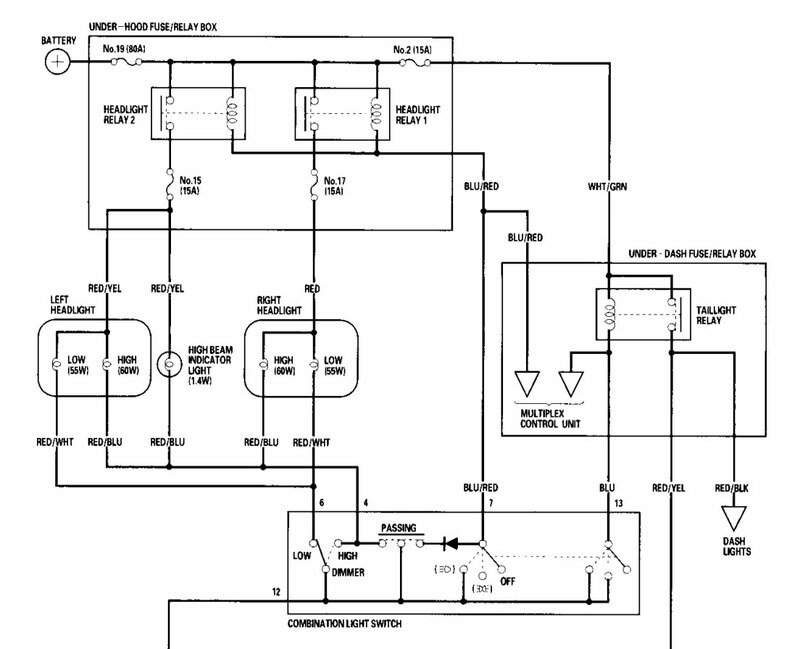 So I started looking through my service manual and found the Honda Civic Type R headlight circuit diagram. 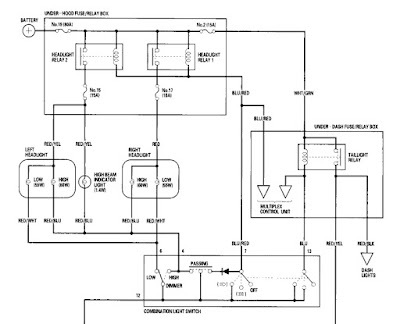 There is some misinformation online, where people are posting that the fuses are separate for main and dipped beam, but what this diagram clearly shows is that the right and left headlights each have their own relay and fuse which "control" both main and dipped beam. So the fuses and relays are split into the right and left headlight, rather than dipped and main beam - from a safety perspective this makes perfect sense as you wouldn't want to be driving down a country lane and have a fuse blow which wipes out dipped beams on both sides would you? The good news is that this eliminated the relays and fuses as the cause of the fault, as if either of them had gone then full beam would not be working in the affected headlight either. On the next probable culprit - the combination light switch aka the 'stalk' on the steering wheel which controls. However, I didn't have to do that as I thought I would test to see if the headlight bulbs were actually getting power first. The dipped beam headlight harness connector is really easy to access and can be pulled off to access the plug. Turn on the ignition (no need to start the engine) and turn the combination switch so the headlights should be on. Set your multimeter to measure DC voltage. The light harness connector only has two terminals. Put the red multimeter probe on one and the black probe on the negative terminal of the battery. You should get a reading of around 11.9v. If you don't get anything, try the other terminal on the headlight harness. Once you have found which terminal is live, set your multimeter to continuity mode and check the other terminal against the negative terminal on the battery. If you have 11.9v on live and a solid ground back to the negative terminal of the battery then congratulations, both your bulbs are just blown. If you don't, then i'm sorry but I can't help you. More investigation would be needed, my first port of call would be checking the combination switch, lots of owners have reported obvious visual damage to the terminals. Both dipped beam headlight bulbs are blown! Well at least that's an easy fix. I was still curious as to how this could have happened so I did a bit more research which I thought I would share. 1) It is fairly common that both headlight bulbs blow within a short time of each other. The reason behind this is probably that bulbs are made to tightly controlled specifications and so you could assume that under almost identical operating conditions, and in the absence of manufacturing defects, you would expect them to have a similar service life. 2) Many times where people claim both bulbs blew at the same time, what actually happened was one bulb was already blown but they didn't notice until the only remaining bulb went, when it becomes very obvious. This ties in with the above point about headlight bulbs blowing within short periods of each other. 3) The other possibility is that they really did blow at the same time and as the first one went it caused a change in voltage which blew the other one. I have no idea how mechanically sound this theory is but it seems plausible. I can't say I'm best pleased as these bulbs were relatively expensive Osram Nightbreakers which were only just over 12 months old (and conveniently just out of warranty). After reading some reviews online I decided to get some cheaper Bosch Pure Light bulbs (based on their excellent review by Which?) and I honestly cannot notice the difference between them and the premium Osram's. 2005 Honda Civic Type R bulb type for dipped beam is H1 55W 12V if anyone is wondering.